Just like some previously neglected London boroughs, there is something strange happening to cinema’s favourite snack: popcorn is being gentrified. It is the snack au fait of yummy mummies and office workers throughout the nation. I’m not sure exactly where or when it started, maybe with Heston Blumenthal’s quest to scientifically reinvigorate the tired snack during his Mission Impossible series in 2011. 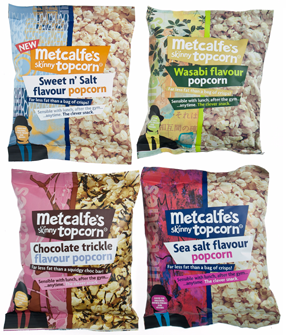 Perhaps that helped widen the reach of Metcalfe’s ‘Skinny Topcorn,’ launched back in 2008 through Julian Metcalfe’s Pret a Manger chain and now stocked in supermarkets nationwide (even my work canteen has it!). In the last 12 months we have seen a real explosion of posh popcorn products, from Tyrells (the classic posh crisp), Propercorn and G.H Cretors, to name only a few. It is a classic example of repackaging and up-marketing a tired old product. All these brands focus on one key message: “this isn’t the popcorn you know, this stuff is tasty and oh look, it’s good for you!” Except popcorn was never bad for you, it’s just corn after all. The cinema version was certainly heavy on the salt and sugar levels, but the calorie count was still relatively low. However, the key marketing message of ‘New Popcorn’ is how healthy it is and how little fat it contains. Huzzah! Metcalfe’s even lists the Weightwatcher’s points for each flavour on their website. This is all good news; desk grazing needed a new champion and it is the perfect response to a guilt-free snacking desire craved by those with a sedentary lifestyle. Previously the reserve of the posh crisp, gourmet flavours have made the jump to popcorn. It is a textbook example of the endlessly cyclical nature of consumer products and trends. I object to paying £4 for a soulless tub of popcorn at the cinema, so…I don’t. I also had no intention of buying ‘Skinny Topcorn’ the first time I saw a packet. Yet now, I see it as a non-threatening snack to indulge upon a few times a week. What changed? Briefly put: branding and exposure. That first packet I encountered was seen as an unreasonable extravagance, but when the same product appears across multiple supply chains and through different brands, it starts to seem normal. The inclusion of the everyman supermarket, Tesco, as a stockist was particularly significant. Previous Post Previous post:Yves Saint Laurent and the Forever Youth Liberator: vampires in disguise or just skincare advertising? Next Post Some water with your order Madam: Still, sparkling or coconut? Very well written article. It will be valuable to anyone who employess it, including yours truly :). Keep up the good work – looking forward to more posts. Thank you for taking the time to comment, I’m glad you liked it!